Today is a glorious day! Why, you ask? Because a one-of-a-kind find just happen to land in my hands. My father-in-law has been a collector of old books for years. Last night he decided to go through the stacks and hand-me-down to…me! 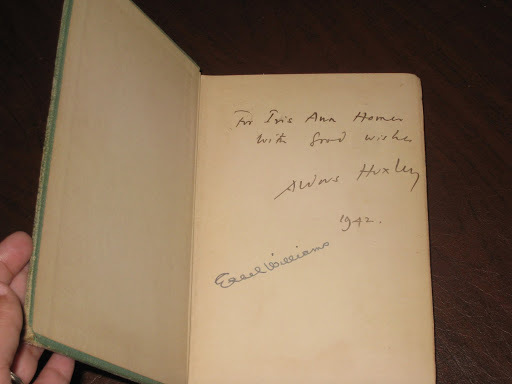 So far my collection has been limited to 1912 1st editions of Titanic books that were printed right after the sinking. I’ve collected them over the course of 18 years in antique shops, garage sales, and auctions. I’m always excited to add another to my bookcase. I’ll have to post some pictures tomorrow, being I’m on the old-book kick. But last night’s find floored me. I looked through the stack he brought out, admiring the aged wonders, scoping out a 1905 almanac, reading about animals from the late 1800’s…very interesting stuff. 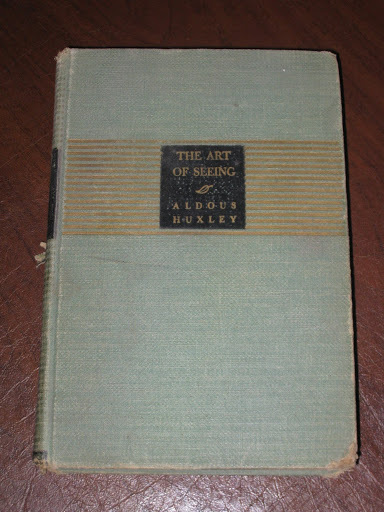 It’s called, “The Art of Seeing” by Aldous Huxley. Every English teacher knows Huxley. (And if they don’t they should be whipped with a ruler!) He’s the author of the 1932 novel Brave New World (usually 12th grade curriculum), which was about the dehumanizing aspects of the scientific process. This is a ground-breaking author, people. Google him. The movies Demolition Man (1993, starring Sylvester Stallone and Sandra Bullock) and The Island (2005, starring Scarlett Johanson and Ewan McGregor) were both based on his writings. He was even credited for screen-writing the 1940 version of Pride and Prejudie for crying out loud! Aaaah, be still my heart. I opened it again for a closer look. 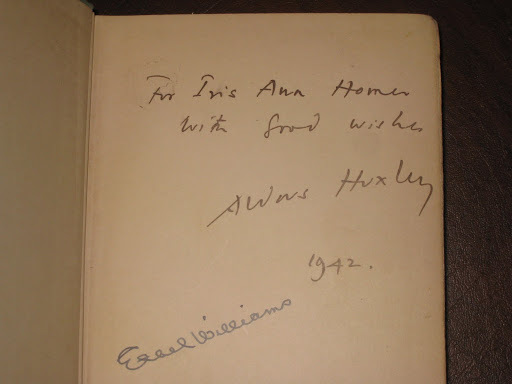 It reads, “For Iris Ann Homer with good wishes, Aldous Huxley 1942.” Then there’s another signature on the bottom, Ethel Williams. (Side note 10 minutes after this post I discovered Ethel Williams was the daughter of the founder of William’s Book Store–rumored to be the oldest bookstore in LA)Check out their website here if you’re interested. I already have a case this puppy is going to go in. I have the spot reserved on my bookshelf. This thing is going to be cherished alongside my Titanic greats. The CRAZY thing is in my work-in-progress, my villain is named Savage…plucked straight from Brave New World. He keeps the book on his desk in his study and my plan was to continue to make small references throughout, including carry-over themes.